A visually stunning decorative map of Corsica (La Corse) dating to 1852, by French map publisher Victor Levasseur. Levasseur published several different editions of his Corsica map - this being first. The island of Corsica is drawn inconsiderable detail showing its many forests, roadways, cities, and three primary districts. By far this map's most striking feature is its elaborate allegorical border work. Levasseur composed this map for publication in his magnificent Atlas Nacionale de la France Illustree, one of the most decorative and beautifully produced atlases to appear in the 19th century. 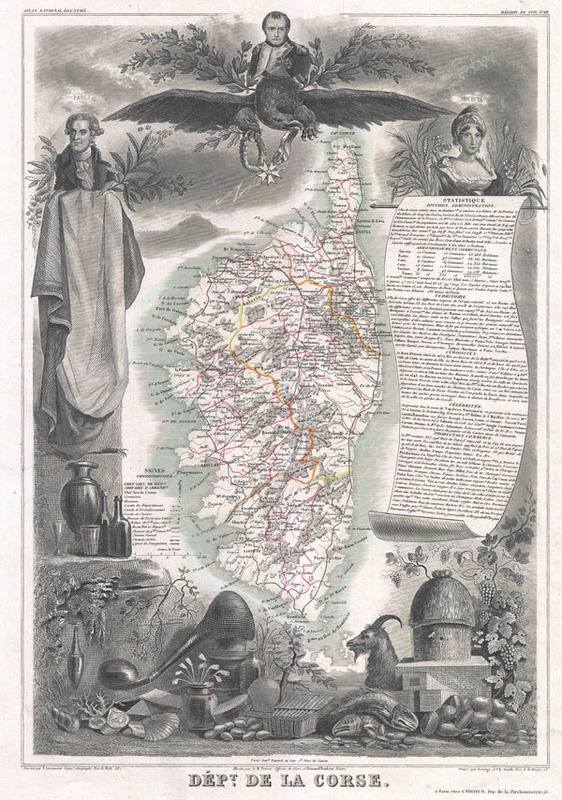 This particular map is surrounded on all sides with elaborate illustrative border work showing the cultural, natural, and trade richness of Corsica. Napoleon Bonaparte, Corsica's most celebrated son, appears at the top of the map, over a great imperial Eagle. To his right and left appear Paoli, a Corsican Nationalist Leader, and Loetitia, Napoleon's mother. The remainder of the decorative border work is given to displacing the the many products of Corsica, including Goats, honey, wines, distilled spirits, seafood, cheese, and sardines. Publised by V. Levasseur in the 1852 edition of his Atlas National de la France Illustree.